We've got 19 ways to organize your kitchen to help you cut clutter and stay organized while cooking and clean--and each one takes that you can complete in 10 minutes or less. These are the quick and easy little projects you can complete while waiting for that pot to boil, including organizing appliances and Tupperware quickly and efficiently, bagging up snacks, and establishing a recycling center. All in 10 minutes or less. Promise. 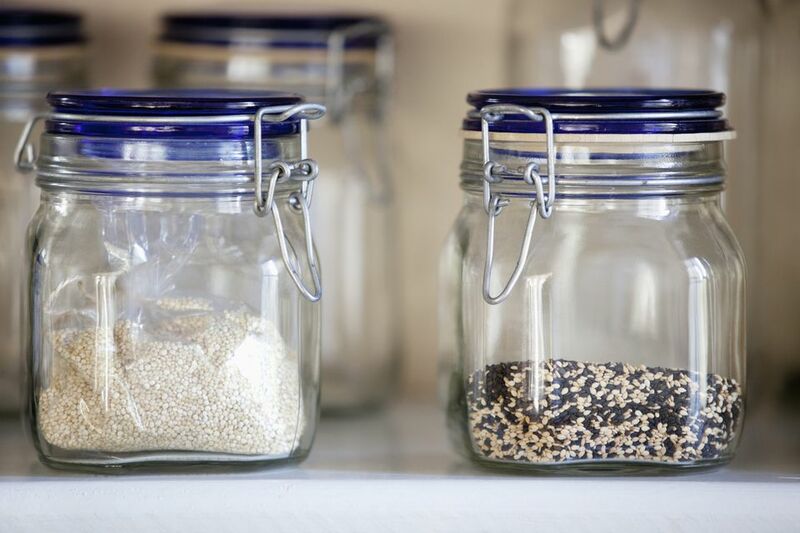 Organize one shelf in your kitchen pantry: take everything out, dust, put everything back in. Corral kitchen helpers. Collect your plastic wrap, aluminum foil, sandwich bags and wax paper and store them in the same drawer. Store plastic bags. Fashion a plastic bag holder, then collect and store plastic bags for re-use. Make a grocery list. If you don't normally make a grocery list, start by making a list of the items you buy every single week. Go from there. Move tea bags from individual containers to a pretty canister. This is both a time-saver and more aesthetically pleasing. Declutter your fridge. Take everything out of your refrigerator, wipe down the inside of your fridge, and arrange items back into place. Organize take out menus. Better yet, recycle these and just use your computer-either check menus online or scan the menus. Why keep extra paper around? Purge your pantry of anything you're not actively using. Think: random spices you haven't touched in a year, stale food, a big bag of flour that's never been used--if you're not a baker, don't devote too much space to baking supplies. Move specialty kitchen appliances that you don't use to the highest shelves. Think: ice cream maker, rice cooker, waffle maker, panini press. I don't like these one-trick ponies. Read why in: 3 Steps to Organizing Kitchen Appliances. Establish a spot for two recycling bins (one for paper, one for plastic), preferably right buy your kitchen trash bin. And voila! You now have your own recycling center. (Despite popular rumors, sometimes it's easy being green. Purge the crisper drawer in your refrigerator of any rotting veggies or fruits. Purge the freezer of freezer-burned items. Separate nuts, chopped vegetables and fruit into small snack bags for quick snacks on the go. NOTE: this one may take 15 minutes, but for something as impactful as garb-and-go snacks, the extra time is worth the big payoff. Organize your Tupperware and Pyrex collections. I combine the two, stack the bowls/dishes inside each other by size and place all of the tops in a square Tupperware together. This works really well for me. TIP: Freezing portion-sizes of soup, stew, rice and pasta-based dishes into round Tupperware containers and then defrosting in the fridge before re-heating on the stove is one of the best habits I've ever developed for quick meals. Organize your cookbooks. Options: Alphabetically, Topically, Aesthetically pleasing-ly. Install a shelf for your most-used cookbooks. Whip Your Bedroom Into Shape in Just Ten Minutes a Day!